When you have a chronic health concern like Heart Concerns, knowing what to eat and what not to eat will have a dramatic effect on your health. Would you like to know what you can do to restore health to your heart? Consider Shop With The Doc! Of all the possible improvements you can make to your diet, limiting saturated fats and cutting out trans fats entirely is perhaps the most important. Both types of fat raise your LDL, or “bad” cholesterol level, which can increase your risk for heart attack and stroke. Luckily, there are many ways to control how much trans fats you take in. Keep these culprits in mind as you cook and make food choices—and learn how to avoid them. Limit solid fat. Reduce the amount of solid fats like margarine, or shortening you add to food when cooking or serving. Instead of cooking with margerine, for example, flavor your dishes with herbs or lemon juice. You can also limit solid fat by trimming fat off your meat or choosing leaner proteins. Substitute. Swap out high-fat foods for their lower-fat counterparts. Top your baked potato, for example, with salsa or low-fat yogurt rather than butter, or use low-sugar fruit spread on your toast instead of margarine. When cooking, use liquid oils like olive, safflower, or sunflower, and substitute two egg whites for one whole egg in a recipe. Be label-savvy. Check food labels on any prepared foods. Many snacks, even those labeled "reduced fat,” may be made with oils containing trans fats. One clue that a food has some trans fat is the phrase "partially hydrogenated.” And look for hidden fat; refried beans may contain lard, or breakfast cereals may have significant amounts of fat. While saturated and trans fats are roadblocks to a healthy heart, unsaturated fats are essential for good health. You just have to know the difference. Omega 3 Fatty Acids. Fatty fish like salmon, trout, or herring and flaxseed, and walnuts all contain polyunsaturated fats that are vital for the body. Monounsaturated fats. Almonds, cashews, peanuts, pecans, and butters made from these nuts, as well as avocado, are all great sources of “good” fat. Avoid Trans Fats. Foods containing high levels of trans fats—such as potato chips and packaged cookies—can increase your cholesterol levels much more significantly than cholesterol- containing foods such as eggs. Trans fat both increase LDL (“bad”) cholesterol. Even worse, trans fat lowers your levels of HDL (“good”) cholesterol. Lowering your Cholesterol with Fish or Fish oil supplements. By adding fish like salmon or herring to your diet twice a week, you can significantly lower your cholesterol, and thus your risk for heart attack. Fish contain omega-3 fatty acids, which work like superheroes, doing good deeds for your heart—and your whole body. Eating a lot of Iodized salt can contribute to high blood pressure, which is a major risk factor for cardiovascular disease. Reducing the Iodized salt in your food is a big part of a heart-healthy diet. The American Heart Association recommends no more than about a teaspoon of salt a day for an adult. That may sound alarmingly small, but there are actually many painless—even delicious—ways to reduce your sodium intake. The DASH diet for lowering blood pressure. 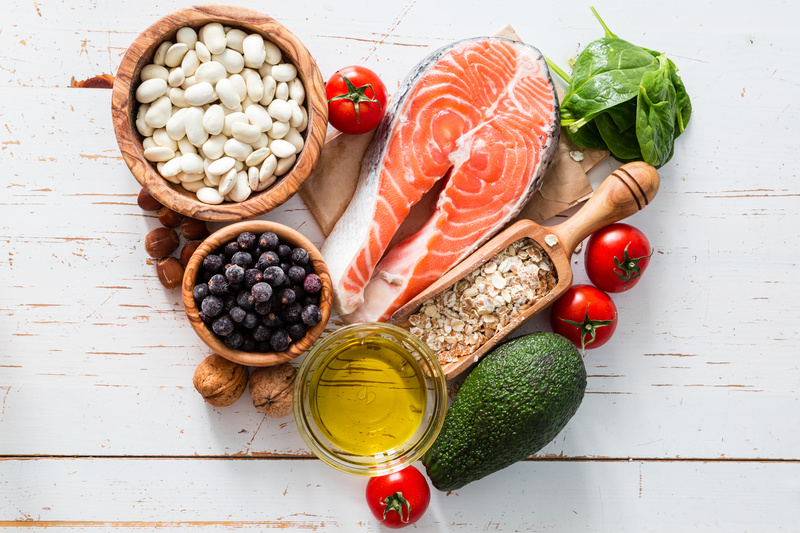 The Dietary Approaches to Stop Hypertension, or DASH diet, is a specially designed eating plan to help you lower your blood pressure, which is a major cause of hypertension and stroke. To learn more, download the booklet from the National Heart, Lung, and Blood Institute found in the Resources and References section. Heart-healthy grocery shopping and stocking. Creating a heart-friendly diet starts with stocking your fridge with healthy and accessible foods. Prepare a list before you head to the store or farmer’s market, and leave a little time after your trip to set yourself up for success during the week. Look at labels. While scanning the aisles of a grocery store in the U.S., look for foods displaying the American Heart Association's heart-check mark to spot heart-healthy foods. This logo means that the food has been certified to meet the American Heart Association's criteria for saturated fat and cholesterol. In Australia, look for the Heart Foundation Tick.